The Zoological Society of Florida and Zoo Miami are hosting Feast With the Beasts on March 7, to celebrate wildlife and tantalize your palates with tastes of the most extraordinary dishes created by some of South Florida’s most renowned fine food establishments. Proudly presented by Ryder, Feast With the Beasts will help support the Zoological Society of Florida’s wildlife education and conservation programs on behalf of Zoo Miami. From 8:00 p.m. to 12:00 a.m., Feast With the Beasts returns in its 21st year as one of the best events in town featuring tastes from 40 local restaurants & caterers, full open bars, wild animal encounters, live entertainment, and complimentary valet parking. Visit www.fwtb.org or call 305.255.5551 to purchase tickets or for more information. Life just got a little sweeter March 8 through 9 with the Miami Fine Beverage, Chocolate & Food Show at Pinecrest Gardens! Expect outstanding cuisine, craft beverages, and gourmet chocolate from the likes of Spartico Restaurant of the Mayfair Hotel, Gallo Wines and Cacao Art, to name a few. Chef Allen Susser will host a rare “Bean-to-Bar” chocolate seminar and “Miami Smoke Affair,” a pop-up event at the gardens, has been designed special for aficionados featuring more than 15 cigar brands. General admission is only $20, and all-inclusive VIP tickets with open bar, free food and complimentary valet is an excellent value at $95. For more info and to buy tickets, visit www.miamifinefoodshow.com. ARC Broward, a not-for-profit human services organization dedicated to providing services to children and adults with developmental disabilities, hosts its third annual superb fundraising event—Delish 2014, presented by The Wasie Foundation. 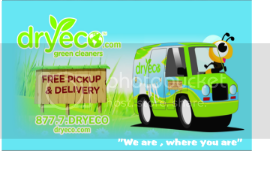 The event will be held on Friday, March 7, from 7:00 to 10:00 p.m. at Hilton Fort Lauderdale Beach Resort. Nationally renowned celebrity chef, Michelle Bernstein, returns as honorary chair of this year’s event which celebrates the success of the ARC Broward Culinary Institute. This is the second year that Chef Bernstein will be judging the event’s cooking stations which showcase the culinary creations of ARC Broward’s graduates. This year’s Delish theme, “Fire& Ice,” will feature a faceoff between two of nature’s strongest elements and allow battling chefs to experiment with different techniques to make the perfect hot and cold culinary experiences. All proceeds from the event will support critically-needed services for children and adults with developmental disabilities and those with various other life challenges. During the evening, special guest Celebrity Chef Michele Ragussis from television shows such as Food Network Star, Chopped and 24 Hour Restaurant Battle will be competing in a quick-fire-type challenge against Hilton Executive Chef Sean McDonald. Both chefs will have an ARC Broward Culinary Institute student chef assisting them with the challenge and Chef Michelle Bernstein will judge two groups and crown the winning team. Guests will enjoy an evening of gourmet treats, refreshing cocktails, dancing, live entertainment, a silent auction, amazing Fort Lauderdale Beach views and much more. Attendees will also have the chance to judge competing food stations comprised of culinary delicacies created by ARC Broward Culinary Institute student chefs paired with chefs of Hilton Fort Lauderdale Beach Resort. Tickets to attend Delish are $125.00 per person; www.arcbroward.com. The Adrienne Arsht Center for the Performing Arts of Miami-Dade County is proud to present the sixth annual Miami Made Festival, featuring for 2014 a weekend-long showcase of new works-in-progress created and performed by a roster of Miami-based artists across multiple disciplines, most of whom have previously collaborated with the Arsht Center. Miami Made Festival 2014 will take place from March 6 through 9 and includes staged play readings and a multi-media performance in the Center’s intimate Carnival Studio Theater. 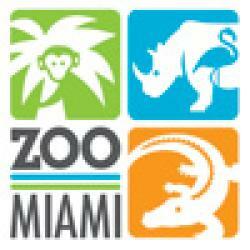 Admission to Miami Made Festival 2014 is free. Free first access pass will be available beginning at 10:00 a.m. on the day of the show at the Box Office (limit four per person). Passes provide guests with guaranteed admission. The Women of Tomorrow Mentor & Scholarship Program will host its gala at the Mandarin Oriental with more than 500 of South Florida’s leading philanthropists, celebrities and politicians on Saturday, March 8. Gala Chair Marisa Toccin Lucas and founders Jennifer Valoppi and Don Browne and Co-Vice President, the Honorable Katherine Fernandez Rundle have planned for an unforgettable evening in celebration of its 18th year of mentoring at-risk young girls in South Florida. There will be more than 3,000 girls benefiting from the program this year. The evening will begin with a cocktail reception, followed by a silent auction. installation to create a dynamic and interactive engagement of artworks and viewer. Attendees will also be given the opportunity to participate in a silent auction including art, experiences and luxury items. Admission to the fundraising event is $250 for two and includes a Rubens Level Membership to the Bass Museum of Art for one year; To RSVP visitwww.bassmuseum.org or call 305.673.7530. 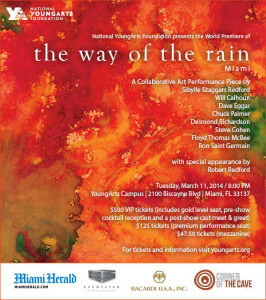 On Tuesday, March 11, the National YoungArts Foundation will present the world premiere of The Way of the Rain Miami, a performance art piece directed by Sibylle Szaggars Redford. This interdisciplinary performance will feature an all-star creative team including YoungArts alumni Dave Eggar and Desmond Richardson, co-music directors Will Calhoun and Chuck Palmer, renowned lighting designer Steve Cohen and legendary sound engineer Ron Saint Germain. There will also be a short film presentation by F. Thomas McBee III, acclaimed video artist and performance by Redford’s husband, Robert Redford. This unique multidisciplinary show pays homage to Earth and its universal elements through the exploration of light, sound, color and texture.a collaborative directed by with Sibylle Szaggars Redford next week’s YoungArts events. Additionally, presented for the first time in Miami will be The Way of the Rain Paintings, a coinciding exhibition featuring Sibylle Szaggars Redford’s artwork will be on display starting March 11 in the YoungArts Gallery. On Wednesday, March 12, the second of six YoungArts Salons will feature award winning actor, film director, and producer Robert Redford and environmental artist Sibylle Szaggars Redford at 6:00pm at the YoungArts Campus in Miami. The discussion on art and activism will be moderated by John S. and James L. Knight Foundation’s Vice President/Arts, Dennis Scholl. Celebrity Sightings: Jennifer Lopez, Alicia Keys, Cee-Lo Green, Tom Cruise…. Special Gifts for that Special Woman in Your Life….Mom!